OUR STORY - 16 Lots Brewing Co.
Our goal is to provide the greater-Mason community a place to gather and enjoy great beer and friends. Mike is a seasoned consumer packaged goods marketing and general management professional, rising through the ranks throughout his twenty-one year career. After graduating from Carnegie Mellon University, Mike began his corporate life in Cincinnati at Procter & Gamble. He went on to successful experiences at Johnson & Johnson and Spectrum Brands. In 2007, Mike returned to Cincinnati as Marketing Director of Sunny Delight and later served as their GM/VP and later their CMO. In 2016 he left the corporate world and started the plans to open a brewery. Mike and his family are proud residents of Mason, Ohio. Jeff oversees beer production for 16 Lots. His affinity for the craft began while growing up in Wisconsin and after moving to Minneapolis— an early hotbed of microbreweries—Jeff began making his own beer. His technique was further influenced by his time living in Cologne, Germany where he found an appreciation for classic styles such as Kolsch and Dusseldorf Alt. Jeff still emulates that true-to-style approach in a wide range of fantastic beers. With a BS in Chemical Engineering from The University of Notre Dame and an MBA in Operations Management from the University of Minnesota, his technical understanding of the brewing process and operational needs will allow us to provide the best products available. At the turn of the 19th Century, Revolutionary War officer Major William Mason relocated his family to Southwest Ohio. Mason surveyed and purchased land — 16 lots — which was platted together on the banks of Muddy Creek. Over the next 200 years the area continued to grow and develop into our beloved city of Mason, Ohio. We are drawn to this area just as the Major was. 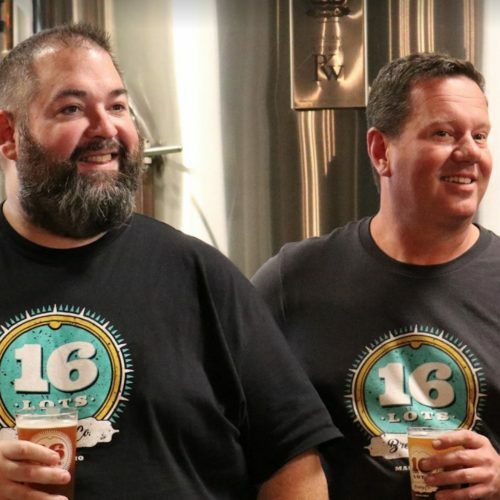 With a salute to our city’s founder, we have formed the 16 Lots Brewing Company — named after those initial parcels of land joined together to form the heart of Mason. Major Mason’s passage to Southwest Ohio and his survey of the land was the inspiration for the logo as well. 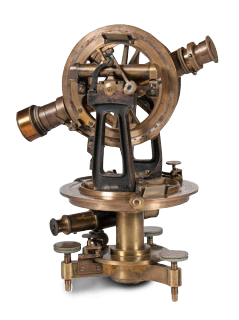 Through our research we discovered the theodolite, a surveying tool of the time, which not only symbolizes our passion for the precise science and mechanics of beer-making but also for the new direction that the brewery founders are taking. Borrowing a wheel from that theodolite and adding another surveying tool — a plumb-bob — to keep us straight and true in our endeavor, we have the foundation of our corporate mark. With a final nod to Major Mason, we implemented the style and color of the numbered buttons worn on Revolutionary War uniforms to signify military regiments. In that fashion we stamp our symbol and the 16 Lots Brewing Company logo is born.